Adele’s enchanting voice moves and guides you into a journey of an energetic connection of the highest order. These meditations CD’s are self-empowering, moving and nothing like you have ever heard or experienced before. As a Master Teacher Adele has brought the Realms of energies closer for you to touch and connect with, opening the vortex of vibrational ascension. Each CD includes a unique guided energetic energy resonating with the vibrational coding of the Council of Light. Please write and share with me your experiences with these two wonderfully Divine guided meditations. We are Blessed in this Light of Love that is with each of us right now. If I may be of assist to you in your Journey you walk in building your foundation of light into your ascension process, then my journey is complete! NOTE: These Meditation CDs are not be used while driving or operating any type or form of machinery. Archangel Michael – League of Angelswelcomes you into the league of Light on a higher strata than was ever offered before. 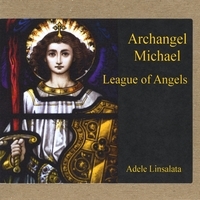 As you are initiated into Archangel Michaels’- League of Angels as Warriors of the Light. Archangel Michaels’ full protection shall always be with you as you journey together as One. Very powerful and miraculous energy of Archangel Michael given to you. Archangel Michaels Shield of Light in this energetic meditation in the highest of highs you are receiving that which you need from Archangel Gabriel, Archangel Uriel, Archangel Raphael as Archangel Michael gifts you with his Shield of Light as a warrior of great strength . Fighting the darkness as a true warrior of Light in all ways. An accelerated journey of energy moves through you, within you and all around you. Simply the best! Click into the Counsel of One Productions to learn more. As in all you do, Bless those around you as you open your awareness up from the foundation to your ascension with all the love and guidance from the Spiritual Realms. May you be Blessed this Day!